It’s time once again for The Hearth and Soul Link Party! Thank you so much to everyone who visited and shared posts last week. Welcome back! 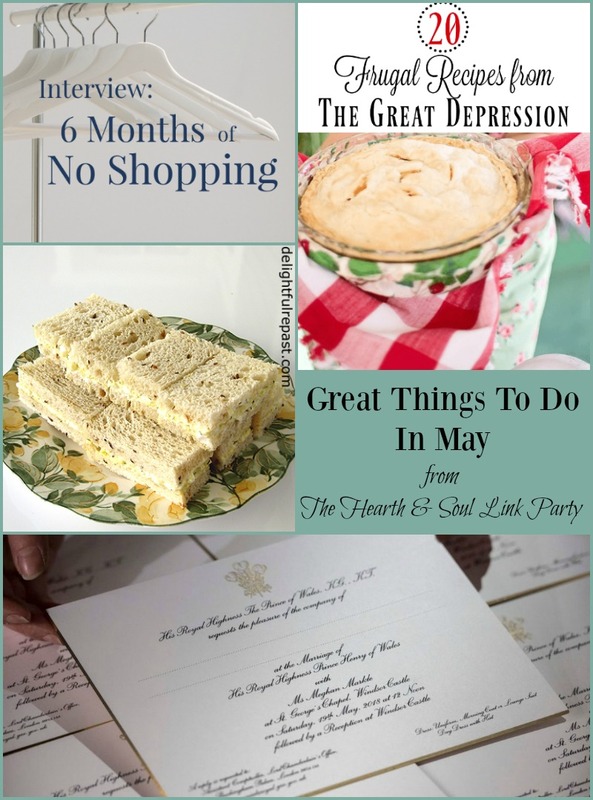 This week I’m featuring Great Things to Do in May. If you are new here, a warm welcome! I would love you to join our friendly link party. It’s a great way to connect with other bloggers, expand your post reach and get some great inspiration on a wide variety of topics. Blog posts about anything that feeds the soul are welcome here. This includes family, home, recipes, decorating, crafts, DIY, travel, organisation, book reviews, the arts, self improvement and more! I’ve been spending a lot of time in London recently. I’ve got so much to share with you – all coming soon! There’s the preview of the wonderful new exhibit at Kensington Palace “Diana – Her Fashion Story” and a behind the scenes tour at the iconic London department store, Fortnum and Mason. Fortnum and Mason have been suppliers of provisions and luxuries to everyone from generation upon generation of the Royal Family to Florence Nightingale and Charles Dickens. Oh, and to me. I love a good visit to Fortnum and Mason! Look what I found when I visited Kensington Palace last week. 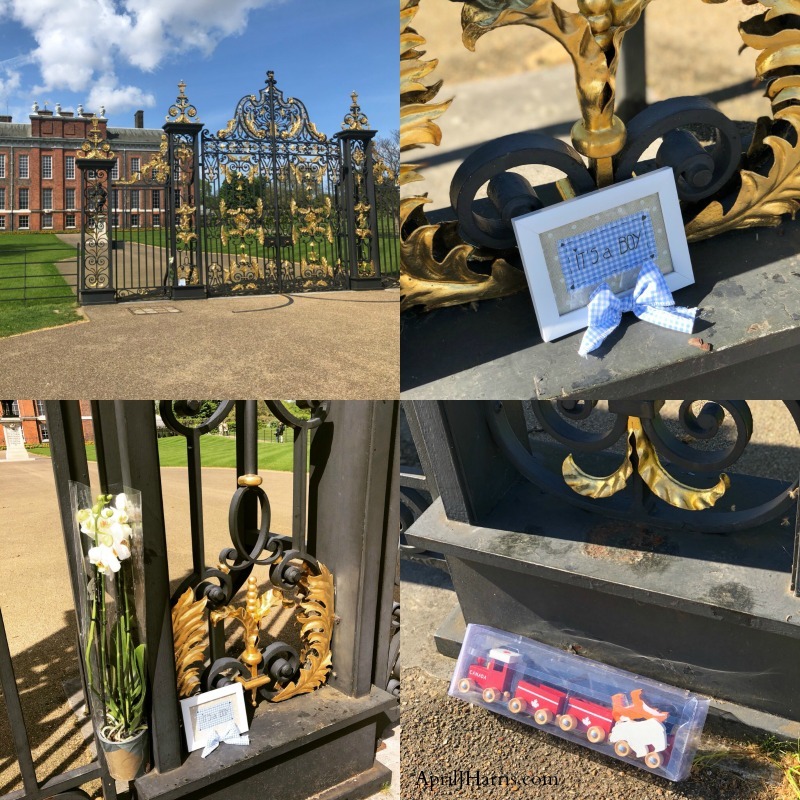 People had left sweet little gifts for the new baby prince. There was such a lovely atmosphere at the palace, it really was wonderful. Our weather has turned very cold and grey again so I’ve been making lots of comfort food. 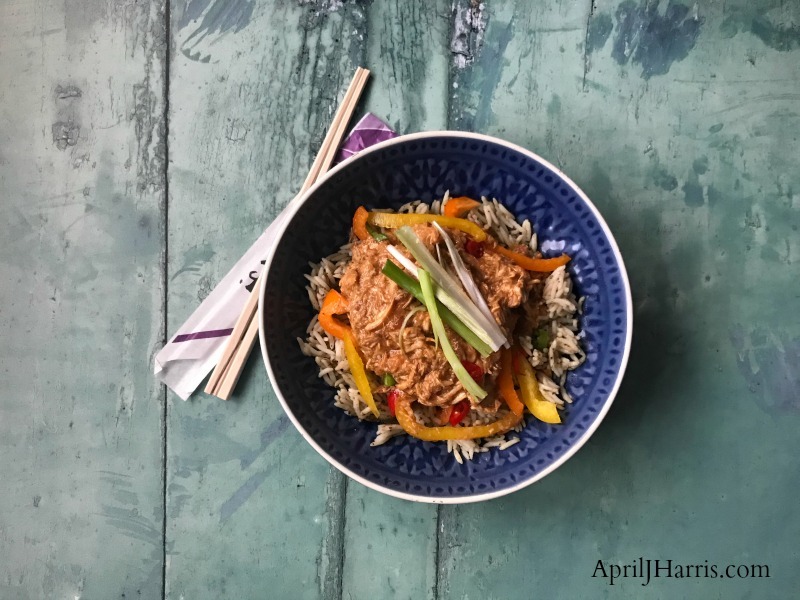 This Honey and Garlic Chicken is full of flavour, and spring veggies make it taste lovely and fresh. 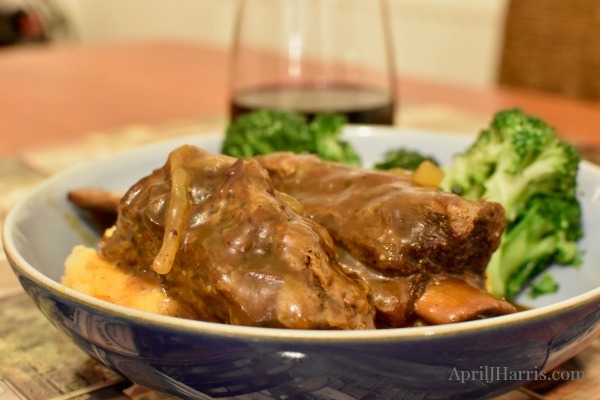 I love the convenience of these Sweet and Spicy Short Ribs. You can make them in the slow cooker a day or two before you need them for quick last minute meals. Their flavour improves with keeping and they taste even better after a day or two in the fridge. 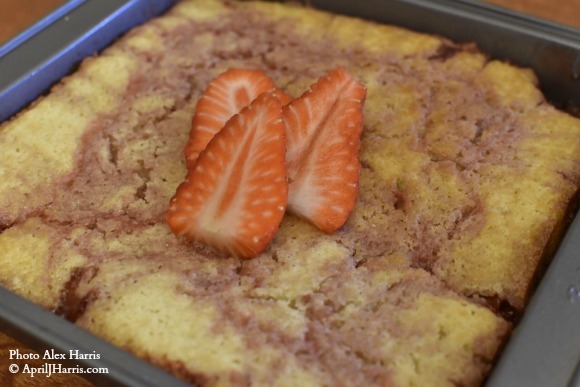 And for an easy, comforting dessert with a nod to spring, you can’t beat this Strawberry Pudding Cake. Save some money with these 20 Frugal Recipes from The Great Depression from Joy at Artful Homemaking. Get excited about the Royal Wedding with Royal Wedding Wednesdays at Laura’s Decor to Adore. Hi Emily, I really am looking forward to the Royal Wedding. I agree, Megan will be a wonderful addition to the “Firm”. She seems like a lovely person. Oh April, how wonderful to see the palace first hand! Lucky you 🙂 This is the first time I learn it’s a boy! So much history right there in one place. Wish I could stroll the streets of London. Enjoy your time there and thanks for sharing with us your beautiful photos! I can’t wait for the Royal Wedding,its so exciting! All the features look great today and thanks so much for the awesome party. I have brought some Green Chili Vegetable Enchiladas with a wonderful Strawberry Dessert Chalupa for everyone to enjoy! April, thank you so much for featuring my tea sandwiches and knife giveaway! Can’t wait to read your upcoming posts about London. In the meantime, lots of great links to check out. Thank you for hosting. You are so welcome, Jean! Thank you so much for all your support! Can’t wait to hear more about London! Have a great week! Thanks for the party April! Have a wonderful week! It’s my pleasure, Roseann! I hope your week is wonderful too! Hi April, I know that you were in California not long ago. Did you get to go to Disneyland? My daughter and I just spent five days there and had so much fun together! I shared our post with our best tops for Disney vacationers. I also shared a wonderful Crock Pot version of Beef Bourguignon. Have a great week! Hi Helen! I was indeed, and I’m heading there again soon. I’ve still never been to the California Disneyland though! (I’ve been to Disney World in Florida and Disneyland Paris a couple of times each though.) Disneyland is definitely on my list so I’ll look forward to your post – and to the delicious Beef Bourguignon. Have a lovely week! Your Diana exhibit sounds amazing! We just toured the American History Museum in D.C. where one of my favorite exhibits was the collection of First Ladies’ dresses from inauguration balls through the centuries. It really is, Michele. I would love to see the collection of First Ladies’ dresses, that sounds amazing too. Have a lovely week! 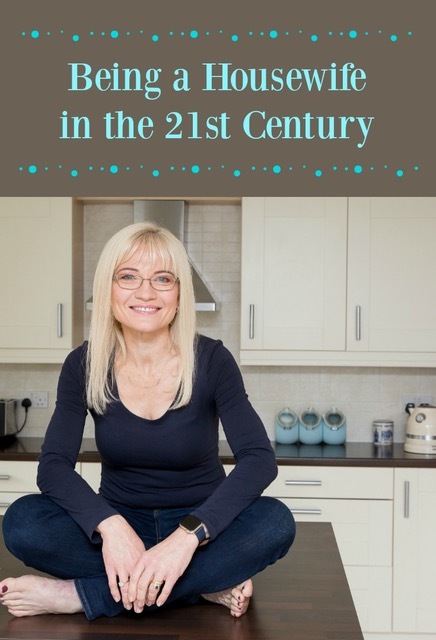 Thank you for featuring my 20 Frugal Recipes post! Have a blessed week! You are so welcome, Joy! I hope you have a blessed week as well!